Location: Lower Mainland BC If this works, it would probably apply to all 55-56 Mopars with single, three pin, high/low 7" headlights. Not sure about the 57s. My situation is I have a 1956 Dodge with two 7" nominal headlights, each with a high and low beam (and three pin connector). The electrical system is based on a 30 Amp generator that doesn't actually output 12V until the RPM is something around 1200, i.e. there is no charging at idle. I would go for a modern alternator but the power steering pump is driven off the back of the generator and I don't want to abandon/change that system. I am currently running GE 2D1 6024 12V halogen sealed beams. The light is quite bright when the battery is up to snuff and/or the generator is actually charging the battery. I would like to go to LED headlights in order to decrease the draw on the electrical system and hopefully increase the amount of light at the same time. I know that the LED bulbs have to have the LED arrays in the same location as the halogen bulb filaments in order to work and I think that Super Nova Perfect Fit bulbs would do that. The problem is (I think) the 56 Dodge head light bucket has limited space. There is a 2.5" opening in the forward bucket *BUT* the distance from the headlight mounting surface to the rear of the inner bucket is only 4.25" and the three pin connector would have to occupy some of that space. I've looked at other LED bulbs and in order to run one with a big heat sink or a fan I would have to re-engineer the inner bucket to make it a) larger and b) deeper. I could do that but I'd rather just find a bulb that will fit without making irreversible modifications. Please have a look at the photos I took today trying to figure this out. Anybody with experience with 7" headlights and LEDs please let me know what you think will work with a Euro H4 headlight housing (probably Hella - I haven't bought anything yet). Location: Southern Sweden - Sturkö island Once you've converted to LED's you can never go back Dave Serge and I made this type of conversion using ultrabright LED's and high quality reflectors and we're both very pleased with the unbeleivable right and strong light. The LED's we're using has the large alumium heat sink and there should be enough space for it if the Valeo/Cibie headlights are used. 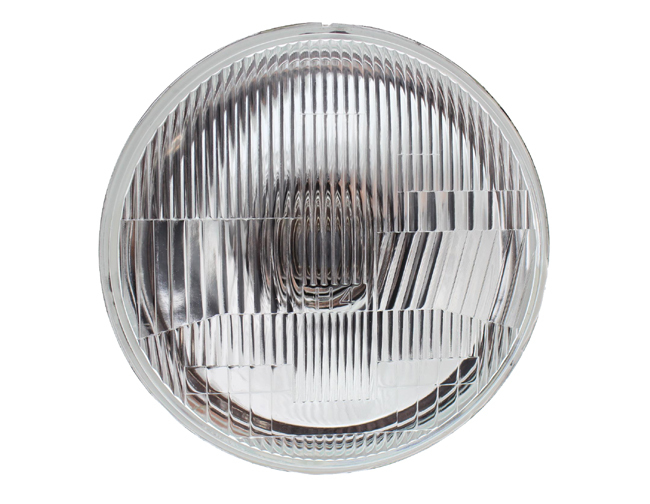 In your case, you can use the Valeo 082440 7" headlights with the correct convex glass and very good optic. The reflector measures 2.5" from the contact surface to the bulb receptacle. I have installed several of these reflectors without any space problems. Location: Lower Mainland BC Sven: Thanks for the info. I reviewed Serge's thread the other day and then contacted him directly. Serge has provided me with some additional info not in his thread. My main concern is both you and he have 4 headlight systems and I am not convinced (yet) that I will have enough space at the back with a Euro H4 housing and a LED H4 bulb with a heat sink. Location: Southern Sweden - Sturkö island Yes, that's correct Dave, but I have installed the 7" headlights with the heatsink LED's in other cars as well. Dieter (di_ch_NY56) has installed the Valeo 082440 headlights on his '56 New Yorker, as I remember with the heatsink LED's. Location: McComb, Mississippi I have done this conversion on a 4 headlight system and like mentioned above, you will never want to go back to the old halogen sealed beams. These LED headlights produce a nice bright white light and use a fraction of the power compared to the old style headlights. I have done this conversion on a 4 headlight system and like mentioned above, you will never want to go back to the old halogen sealed beams. These LED headlights produce a nice bright white light and use a fraction of the power compared to the old style headlights. But you four headlight guys have the luxury of tucking all that wiring *outside* the actual headlight buckets. I don't have that possibility with a single headlight system. Thanks Mike. I decided that I didn't like the lens pattern on those CIBIE/Valeo 082440s and found some EMPI H4s that were cheap and local. OR this (Valeo 082438) but I don't really like their look either. Location: Southern Sweden - Sturkö island I can agree that the pattern in the optics has some cosmetic flaws, but the pattern are there for optic reasons, probably the best headlight available on the market. Yes, Dave, it's my car, but it's seems that you don't want to read that I installed several 7" headlights, with LED's WITH heatsink AND the receptcale. As I wrote, Dieter has installed 7" Valeos on his '56 New Yorker. You can always remove the plastic receptacle and connect the wire directly covered with shrink tube. I can agree that the pattern in the optics has some cosmetic flaws, but the pattern are there for optic reasons, probably the best headlight available on the market. I don't disbelieve you Sven but I would like some photos and details regarding the 7" conversion(s). I've emailed Dieter and asked for these. If you have some, please post them. My problem here in Canada is I can't just go to an automotive parts store and buy an H4 housing let alone a specific Valeo H4 housing. E-code H4s headlights were not installed on any North American vehicles. I have to search out specialty on-line stores that deal with Hella, Valeo, etc. in the aftermarket, typically for the older Volkwagen crowd. I was lucky enough to find one such on-line store that happens to be local to me who had some H4 housings. If I can get these EMPI H4 housings to work, then I will consider tracking down the Valeo housings that you have recommended. I have the headlight bucket out of the car now and that enabled me to make better measurements that give me more confidence that there will be enough room to work with the OE three pin connector. Now to find some decent H4 LED lights locally. Location: Southern Sweden - Sturkö island The locally provided LED headlight lamps will most surely have a much lower output than the "yellow" ones Dave. That said, "my" LED headlight lamps are not approved, hence they will not pass the inspection here (if the technician can figure it out). Unfortunately, I have no photos on any of the 7" headlight installation. The latest one was a Dodge Dart '66 with pots simular to your ones. Next will be a Chevy '57. But they also have a small electronic box that must be hidden somewhere (in the photo of my car, the box is now between the headlights (2 H4 headlights replaced with 2 H1 Valeo 082369 for a high improvement of the beam length)). Are you saying one can remove and relocate the large "whatever" behind the LED H4 bulbs? If so, that is great news as there is virtually no room behind a 60 Plymouth headlight bulb. Can you please post picures of your conversion?! What type are you using? There are 100s on the market. So far I resisted cutting my OE wiring harness for a headlight relay, even though I can use the headlight knob on the dash as a cigarette lighter, with the headlights on. Looks like it was a wise decision, with LED available these days. Thanks Mike. I saw that one the other day. That is US$15.99 each so say US$32 for two. That's about $43 Canadian. Plus shipping plus brokerage/duty etc. I just paid $44 Canadian with no shipping but local taxes, total $50 Canadian and I will pick them up after I have breakfast. I did not know they were plastic. Good to know that Valeo and Cibie are one and the same now. If I find Valeo glass ones that I like, I can give the EMPI ones to my VW enthusiast neigbour who is always doing me favours. No Sid, the heat sink is a must, however on the LED's with the large aluminum heat sink, it's possible to demount it and then turn it down somewhat in a lathe. I can send you some info over e-mail Sid, I Think that's the easiest way…. Do you still use the same e-mail address, s.....b.....@y.de? Location: northern germany Thanks, Wizard. Yes, still the same E-mail but I do not think turning down the heatsink would work as the lengths is the problem. Even the OE wires bend down 90° just after the plug, touching the fender, maybe because of the H4 headlights. There is actually lots of room in the wheelhousing, but I do not want to cut the fender, even when it is not visible and one probably could more easily change bulbs from the wheelhousing side. Location: Netherlands I've installed the CSP H4 9003 HB2 - LED lights in my '73 Dart, which also has 7" headlamps. Although these lamps are only 60W, they emit a much 'whiter' light then normal H4 lamps. I would like to try out the 180W with much more lumen. I've installed the CSP H4 9003 HB2 - LED lights in my '73 Dart, which also has 7" headlamps. Did you have to trim anything to get them to fit? I can't find a link to the product that you used to get sizing info. Dave, too ugly and plastic for you, but good enough for me, do these have a external ballast, I cant tell?? I think that the driver/ballast is internal to the housing, i.e. plug and play. Price is good. Not sure about the light performance though. I think that a H4 55w bulb halogen conversion with relays, even with a generator, would be adequate for the amount that we are going to use them . I now avoid old car night driving when ever possible, at best 6 km from dairy queen to home on ice cream night. Smarter then 20 years ago when two of us ('37 Ford & '31 Chevy) came back from Banff Rod Run through Kootenay Nationak Park at one in the morning. Very dark. Location: Netherlands Yes, those are the ones I'm currently using. Yes, those are the ones I'm currently using. Thanks for confirming that. In the meantime, I bought a set off eBay coming out of China or Taiwan. Delivery says: "Wed, Dec 05 - Thu, Jan 17"
So I am moving onto H4 Halogens on relays in the interim. My 1956 New Yorker first got Hella H4 headlights. They work, but do not look time correct (flat lens). So I replaced it with the Valeo O82447. 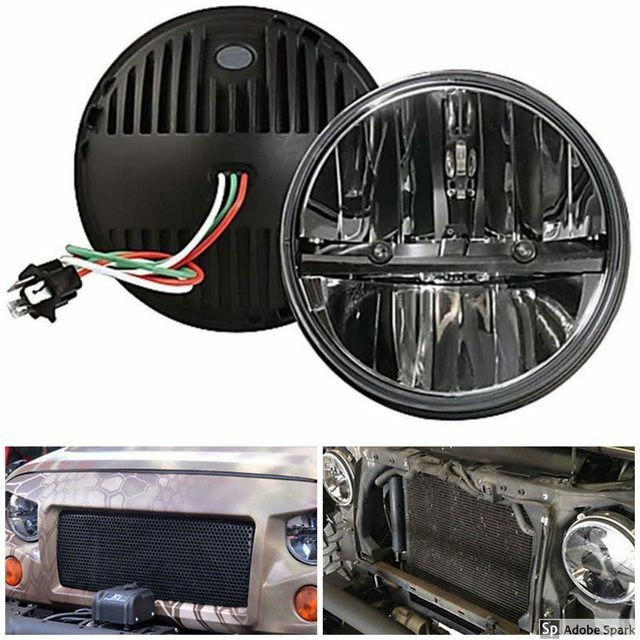 These are 7" headlights for single head light applications. For my Letter I purchased two sets of Valeo O82374 5 1/4" headlights for dual headlight applications. Plus I purchased two Autopal No 070214 5 1/4" H1 headlights (/w not street legal 100W H1 bulbs as a package). Unfortunately I didn't find 5 1/4" H7 headlights /w a convex lens for the inner headlights (high beam function). BTW: at my former truck (based on a 1962 Dodge W200 power wagon chassis /w cowl, hood and front end) there was a dual H4 conversion mounted (Hella, flat lens). Because the headlights were ways higher than on any passenger car I always had more than enough light during night rides. Location: northern germany Do these LED supply asymmetric light, as required in Europe? Location: Netherlands They do, but 'kinda'. I don't think they will pass the light-image check during the check-up. The part that takes care of the biased light-spread is made of cheap chromed plastic, which makes for a bit blurry image IMO. (At least, it appears plastic. Didn't confirm that yet). I Googled "Valeo 082447 headlights" and nothing good came up. Location: Southern Sweden - Sturkö island Search for Valeo 082440 - that is the 7" version. Do these LED supply asymmetric light, as required in Europe? My ones does give a clear assymetric light Sid, part of it is also the glass optic. Some, as Herman writes are more fuzzy. I've discussed the LED headlights with the local Opus inspection manager. He informed me that the LED's headlight lamps are not allowed here in Sweden. This is based on a reglement that's more than 50 years old here and the mangager told me that the authorities has started to look at the old reglement versus many new developments that improves safety but are still not accepted. Search for Valeo 082440 - that is the 7" version. Sven: I know what 082440s look like and I strongly dislike them. Dieter says he used 7" 082447s. I want to see what they look like, not the 082440s. My 1956 New Yorker first got Hella H4 headlights. They work, but do not look time correct (flat lens). So I replaced it with the Valeo 082447 These are 7" headlights for single head light applications. Location: Southern Sweden - Sturkö island The 082447 is a surely a typing error Dave - I have the complete Valeo catalog and there's no such number. Location: Lower Mainland BC The expensive SuperNova LED H4 headlight bulbs came in today so I installed one of the EMPI 7" H4 housings and one of the Headlight Revolution SuperNova bulbs. The EMPI housing didn't want to fit 100% (issue with the placement of one of the stand-offs that locate the housing in the headlight bucket.) I made it work (I hope). Installation of the bulb was a no brainer. This one does not use a cable or driver, just a straight plug and play into the existing OE three flat pin headlight connector. I also ordered the corded ones that BigBlockMopar used but they are "lost" somewhere in US Customs awaiting clearance and then USPS just in time for the Christmas crush. Yes, it's a typing error... the number you mentioned is correct (082440 Valeo 7" headlamps). Thanks. He said "Yes, those are the ones" or words to that effect. I think that before I got an answer, I bought a set off eBay (CDN$29 with free shipping (to Point Roberts WA)). They came out of China through Hong Kong and *E*v*e*n*t*u*a*l*l*y* they arrived in Point Roberts from Hong Kong via New York City (shakes head). I finally got around to installing one just now alone with another new H4 leadlight housing, this time in the passenger side. The big heat sink fits through the hole in the back of the first headlight bucket and plugs into the OE lighting harness three pin socket. The light is bright, probably brighter than the GE Halogen sealed beam that I removed but it is NOT as bright as the SuperBrite LED that I installed in the driver's side H4 headlight. That said the SuperBrite is annoyingly bright. There is a big wind storm going on right now so I decided to NOT pull the car out of the garage and take a comparison photo. Maybe tomorrow or Saturday if the winds go down and rains hold off. the EMPI and the all in one bulbs are the way to go. Okay it was dry and sunny(ish) and 6 C (but no snow on the ground) so I fired up the old dear and got it out to check out the headlights. The photos below have the cheaper Chinese H4 LED bulb in the passenger side and the expensive SuperNova Retina-burning LED in the drivers side. One low beam photo and one high beam photo. Both me and my car enthusiast neighbour like the cheap Chinese LEDs better. None of the photos show what reality is actually like. I also agree the Chinese lights are indeed perhaps the same or just a tad brighter than regular H4 lights, but since they emit a white light, they appear brighter. How is the light-image of the SuperBrite's when shining the headlights on a white wall? In Europe, the light-image emitted by headlights should be biased clearly to the right a bit, to prevent blinding oncoming cars. Location: Southern Sweden - Sturkö island I have ultra-bright white LED's Dave. It's just a matter of aligning the headlights better. Wait until you drove the car at night for the final decision. I bet the SuperBrites have a better light beam, higher quality and will last longer. LED Headlights and Reflector with convex glass VALEO A082374: Presented 2017-03. Needs 2 - 3 clicks in Google and some suppliers are found! Some of you did it already successfully. LED Headlights and Reflector with convex glass VALEO A082374: Presented 2017-03. Needs 2 - 3 clicks in Google and some suppliers are found! Thanks for the reminder Serge. I chased your suggestion previously but did not find what I wanted in NAmerica or I did not like the pattern in the glass lens. Convex glass VALEO A082374: The wrong link has been corrected (thanks Sven). The main problem was to find a reflector that fits, then there are many suppliers. 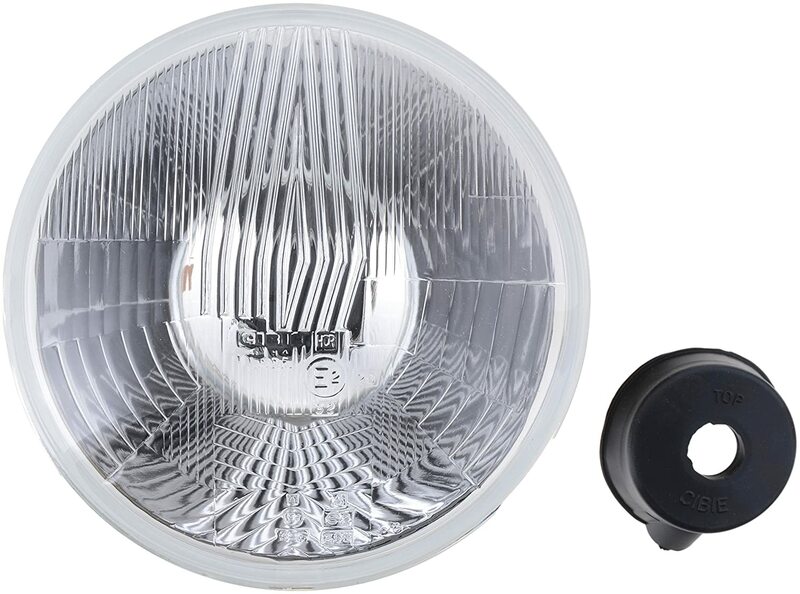 Most of you using these convex 5 1/4" headlamps are claiming they accept H4/H7 bulbs. The H7 bulb (doesn't care if LED or conventional Halogen) have a completely different socket style than H4 bulbs. At least in the boxes I got - no interface was by laying. How did you solve that, Serge? I will be interested in the answer. What I do know is the H4 bulbs (Halogen or LED) connect directly into the 56 three-prong headlight socket(s). Worked fine for me. Location: Southern Sweden - Sturkö island I started out just like Serge, with 4 H4 headlamps, using only the high beam led element in the inner headlights. This was a huge improvement, much due to the Valeo 082374 5-3/4" optic glass, but I was not very pleased with the lenght of the high beams. I made some investigations as for finding a H1/H4 adapter, but didn't find any. I also searched for H7/H4 adapters, but no success. 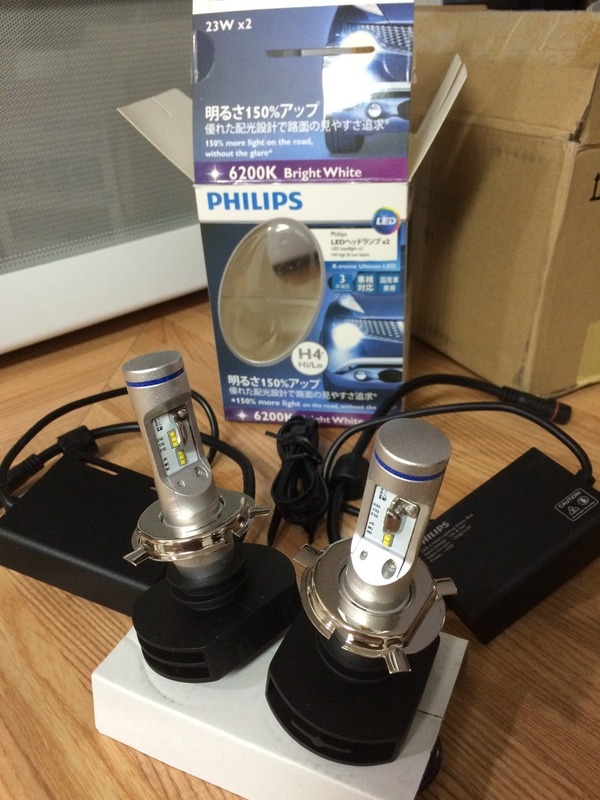 Finally, I bought two Valeo 082369 high beam headlamps for H1 LED's (or halogene bulbs), with a different optics. Now I have two Valeo 08237, with H4 low/high beam LED's in the outer position and 2 Valeo 082369 with H1 high beam LED's in the inner position. 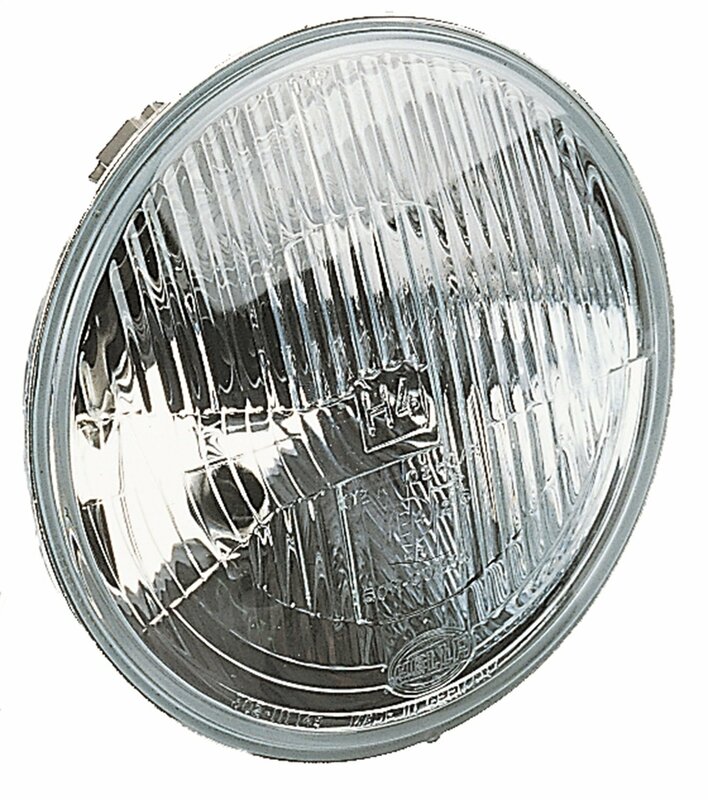 This combination gives a very good lenght on high beams, combined with widht from the H4 headlamps. I did make some homemade adapters for the H7 in H4 headlamps, but I didn't test them. The H4 LEDs from Philips I purchased, as illustrated, they fit and are mounted without any tricks. I used 4x the same H4 LEDs and Valeo Reflectors. By a separate switch I can select all lamps together (4 parallel), or separate outer and inner lamps. Assembling was as a LEGO game, even the Mopar 3-pole connector fits to the LED, no soldering, no extension. I was thinking all is clearly illustrated - may-be not? (check the link). wizard - 2018-12-25 8:17 PM I started out just like Serge, with 4 H4 headlamps, using only the high beam led element in the inner headlights. This was a huge improvement, much due to the Valeo 082374 5-3/4" optic glass, but I was not very pleased with the lenght of the high beams. I made some investigations as for finding a H1/H4 adapter, but didn't find any. I also searched for H7/H4 adapters, but no success. Finally, I bought two Valeo 082369 high beam headlamps for H1 LED's (or halogene bulbs), with a different optics. Now I have two Valeo 08237, with H4 low/high beam LED's in the outer position and 2 Valeo 082369 with H1 high beam LED's in the inner position. 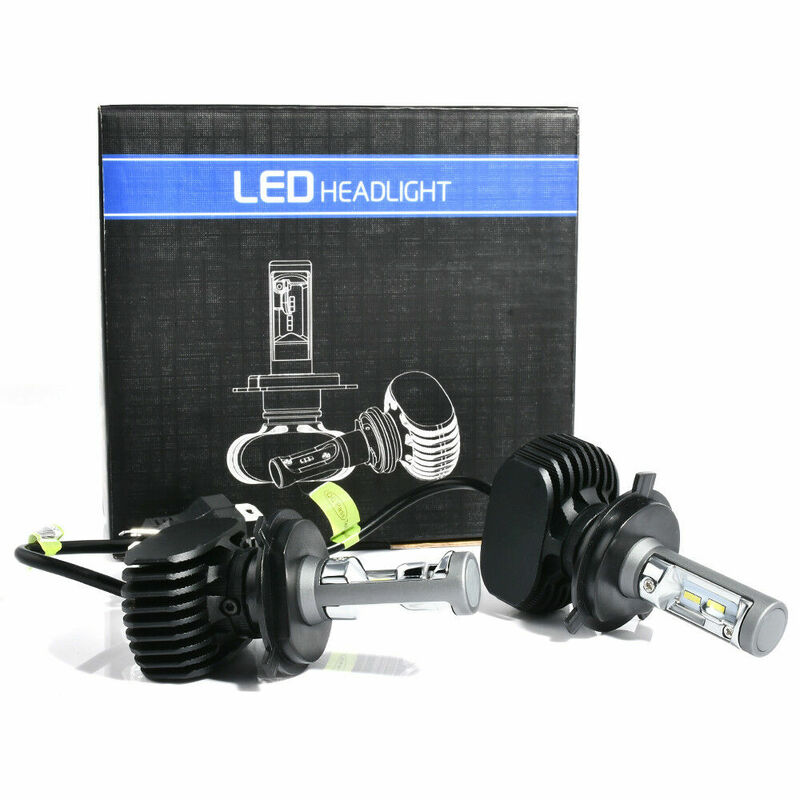 This combination gives a very good lenght on high beams, combined with widht from the H4 headlamps. I did make some homemade adapters for the H7 in H4 headlamps, but I didn't test them. It's exactly as I pointed out. With no success I seeked as well for an adapter to fit the LED H7 beam into the H4 adapter hole. The diameter of LED H4 and LED H7 tube with the LEDs is different as well (just a sleeve would help, but the theoretical point of emitting light is different with H4 and H7 LED beams in the same reflector). For my Letter I'm owning three pairs of lamps. Two Valeo 082374 sets equipped with CREE H4 beams and one set of VALEO 082369 with H1 beams Sven proposed to me. I had some time to kill waiting for my neighbour to come home to help me remove 165 lbs of cast-iron 57 Windsor TF from the cargo area of my 94 Audi, so I decided to compare the LED bulbs one more time and decide on which type to install as a pair (instead of one and one). I decided on the cheap Chinese eBay ones. So I removed the SuperBrite from the driver's side headlight and installed the cheap Chinese (with the cable). Strangely, it looks the same as the SuperBrite. Since the bulbs are the same now on both sides, I think I need to adjust the orientation of the passenger side bulb (there is a set screw on the bulb mount so you can rotate the bulb). I decided that will have to wait for another (warmer day) so I reinstalled both headlight "doors" so the car looks like a 56 Custom Royal again.